Every loving mum will know that breast feeding is the greatest gift a mother could give to their lovely babies. The magnitude benefits of breast milk are unlimited. 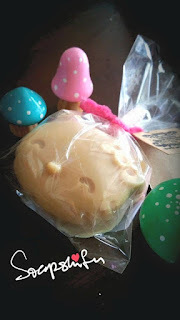 Most commonly know would be good in digestion, strengthening baby's immune systems. 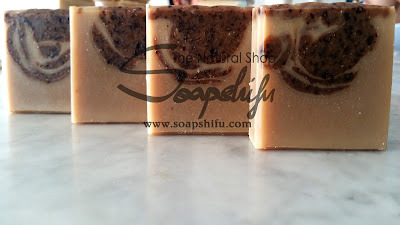 But do you know that its also packed with load of rich natural nutrients which also moisturizes the skin, leaving skin soft and smooth. and many other skin disorder issues proven in a recent study done by researchers. WHY are our Breast Milk Soap so Popular? 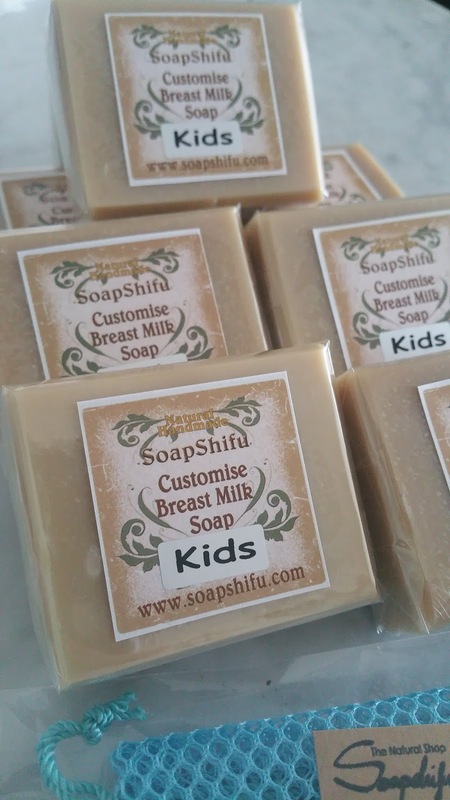 Soapshifu takes pride in every bar of soap we make and ensure its made with love and best of quality natural ingredients imported from many parts of the world for you and your little ones'. 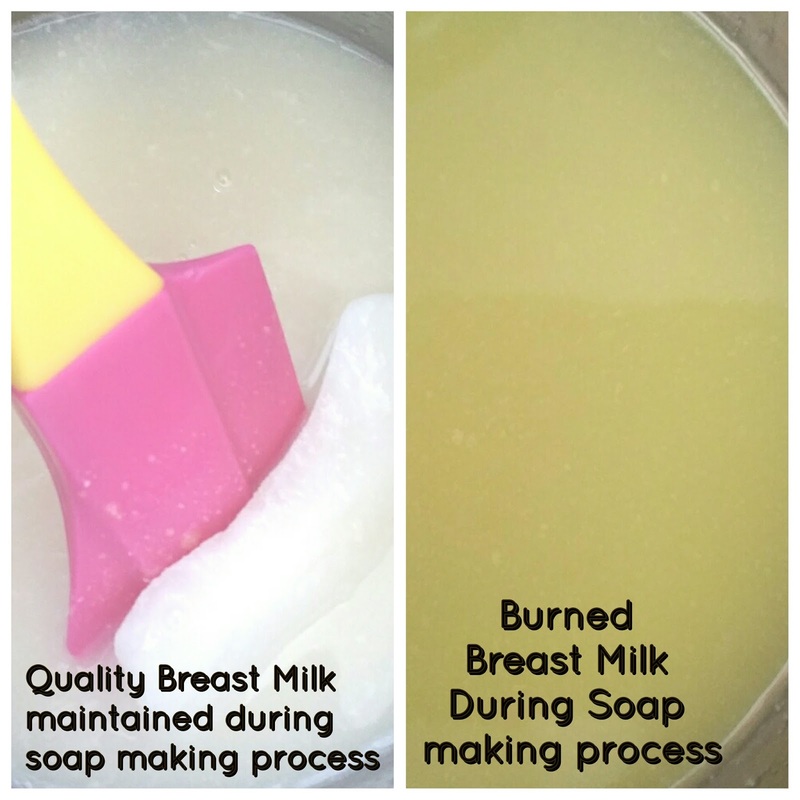 Every mummies' Breast Milk are cautiously mixed (using a special secret kept method) where BM are kept at constant low temperature with precise timing while mixing with other natural ingredients to ensure that it doesn't turns (yellow/ dark brown) due to over heating during the process, untactful handling will cause nutrients to drain out during this intricate and time consuming procedure. During hot sunny months, haze season at its peak, and poullution on the rise - allergies, eczema, rash and itch will be easily aggravated. And it always aches a mother's heart to see our little angels suffer from these frustrating conditions. knowing the misery of what medicine often provides solutions for these pesky skin conditions through the use of antihistamines, steroids, or topical numbing creams whose side effects may prove worse then the original ailment. It can seem to be an expensive cycle of unending relief. If you suffer from the above listed ailments, I have hope for you. 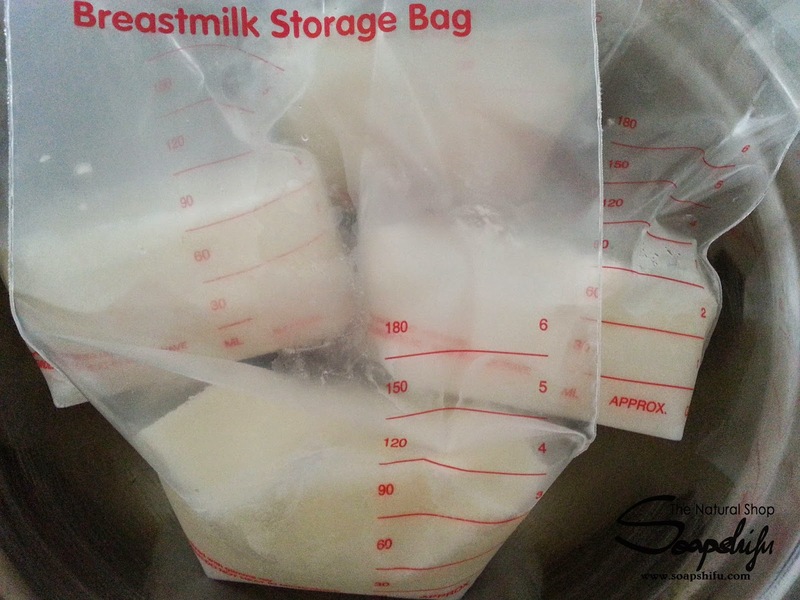 New research has proven that breast milk has the healing power to eczema, psoriasis, sunburns and itchy dry skin. Although the idea of rubbing breast milk on your skin may seem a bit unconventional, it is proving to be a safe and sometime superior treatment to other medicinal options. 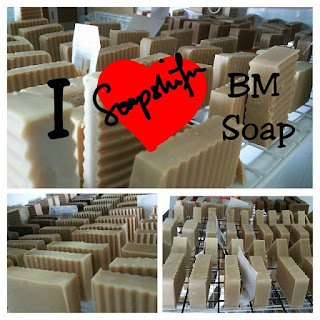 Presenting BM Soap as GIFT? 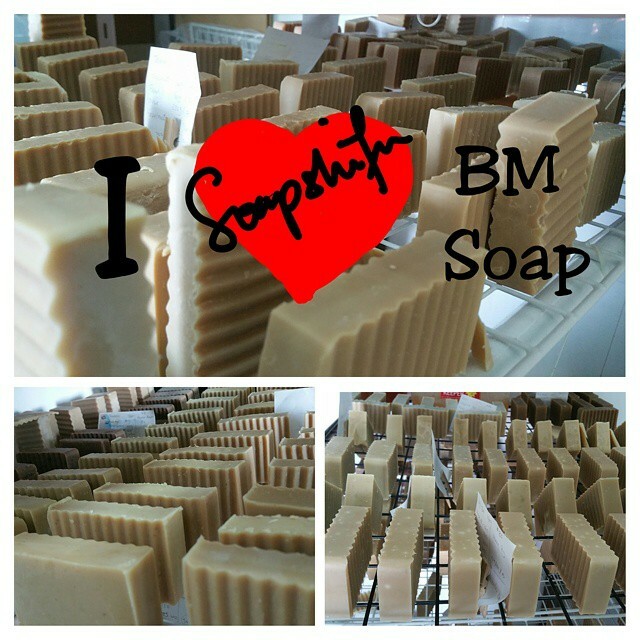 We can help you give that special touch to your BM Soap. 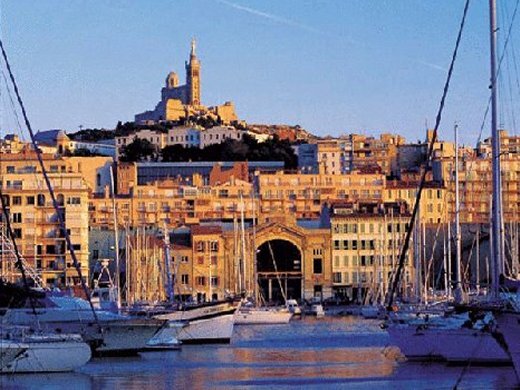 Taking a stroll down the historic and picturesque mishmash of sloping streets, lanes of ochre buildings and terraced houses, indeed a scene so picture-perfect. 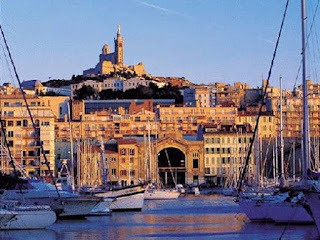 Marseille town holds one of the oldest port in France, the colourful Vieux Port (Old Port), crammed with fishing boats and int he heart of Marseille, is Savon de Marseille, the Marseille soap. 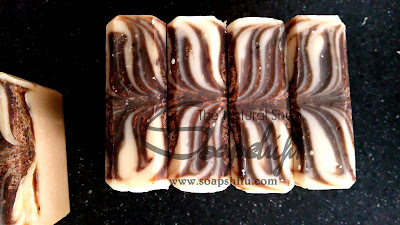 The Marseille soap is one of the oldest moisturising soap that fosters fully vegan soap that uses at least 72% of olive oil. In Soapshifu`s very own Le France De Marseille soap, we push the boundaries of Marseille soap while retaining its former glory of olive oil base. Adding extra virgin olive oil, grape seed oil and shea butter, our Le French De Marseille soap fully maximise its anti- aging and moisturising qualities. 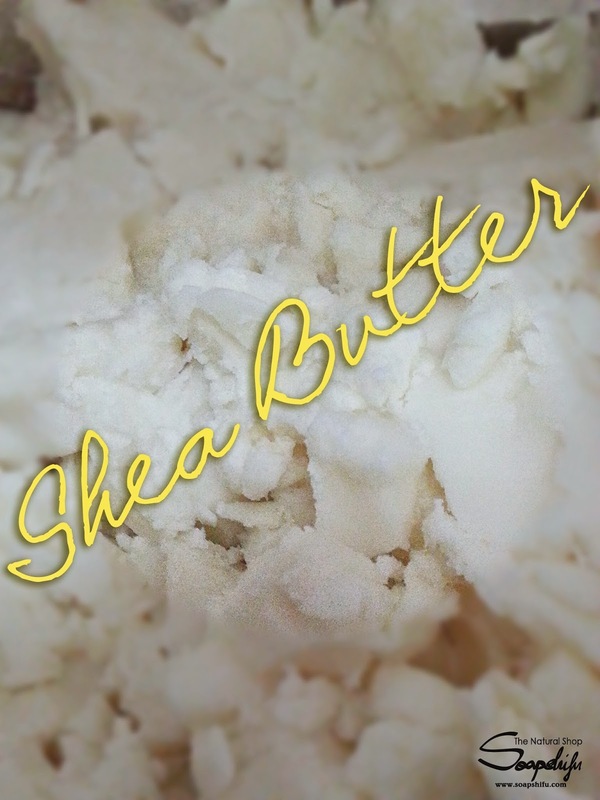 Our purest form of shea butter is able to amplify our Le France De Marseille soap with its nutritional punch of vitamin A, kicking away blemishes, winkles, eczema, dermatitis and providing a natural source of UV protection for your skin. 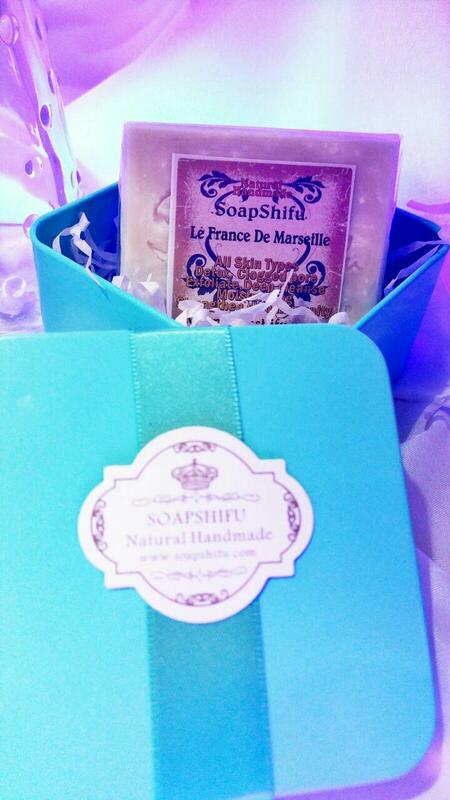 As like every authentic Marseille soap, we blend organic French sea salt into our very own Le French Marseille soap to enhance the anti-toxin and cleansing of clogged pores in our soap, gently exfoliating your skin with every wash.
Soapshifu believes in giving you every bar of soap made with love. 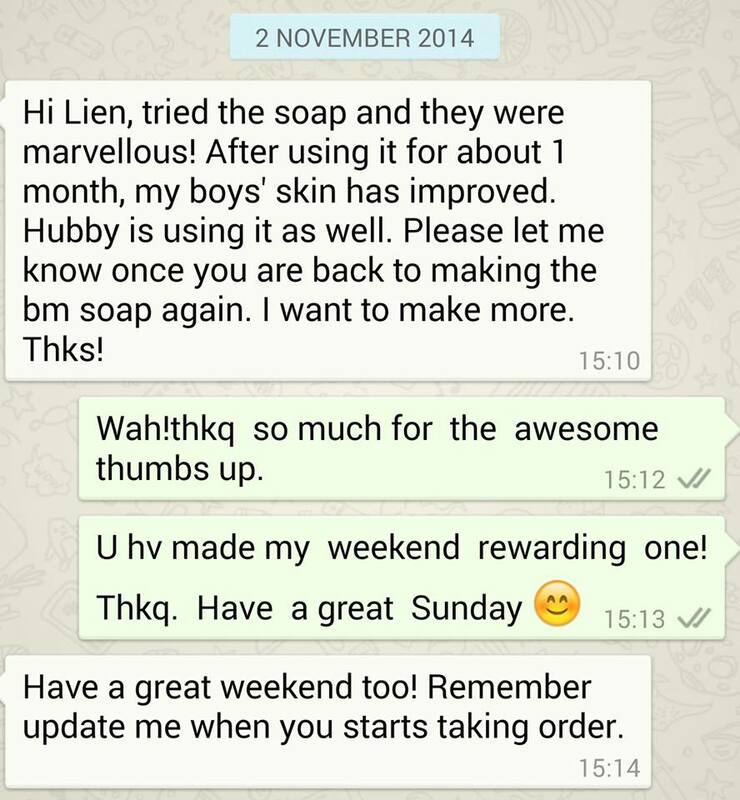 This is why we take your aromatic care into consideration. Fused with lavender and eucalyptus essential oil, our Le French Marseille soap delivers a harmony of refreshing scent with benefits like stress relief, anti-insomnia, anti-anxiety/depression, insect repellent, anti-septic and natural sunscreen. 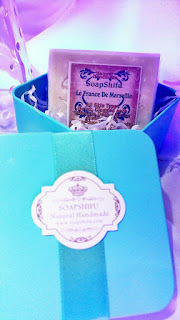 Le French De Marseille soap, a traditional jewel refined. Volcanic Ash or Sodium Bentonite clay is mined from the earth, and it’s formed after volcanic ash has weathered and aged in the presence of water. 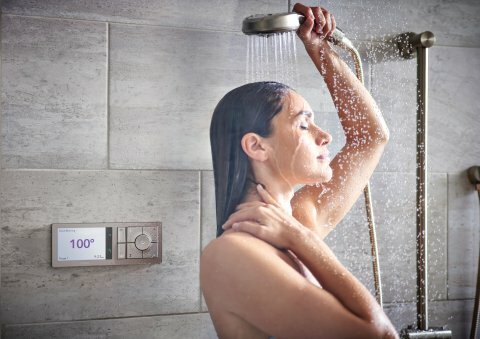 It has a strong negative electromagnetic charge, and when activated by water, it acts like a magnet in and on our bodies, pulling metals and toxins to it. It also has an affect on the body’s pH and provides the body with some vital minerals at the same time. What are the awesome content found in Volcanic Ash? 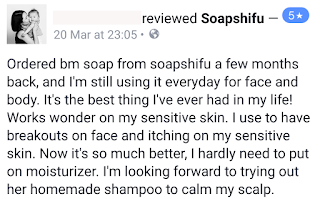 Are you having these skin issues? 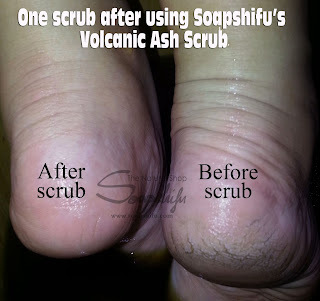 Benefits of Volcanic Ash Scrub. 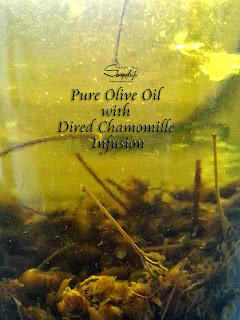 Removes the dead cells from surface of the skin which results in revitalized complexion. Treatment of Eczema, psoriasis, rashes, blemish, wrinkles, cellulite, stretch marks, etc. Prevent or remove foot corn. 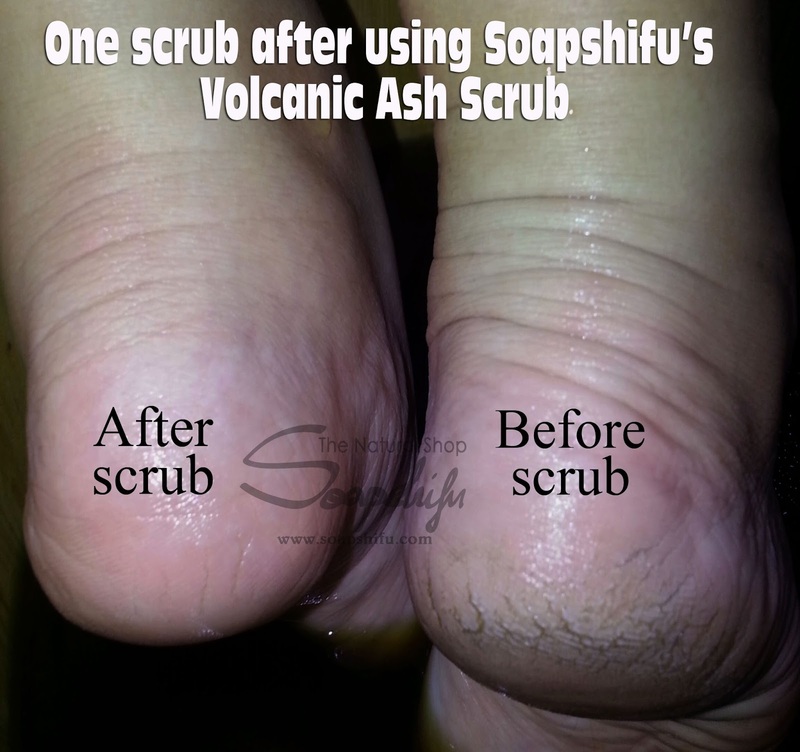 Rinse body or feet with warm water, apply lathered soap on areas which require scrubbing. 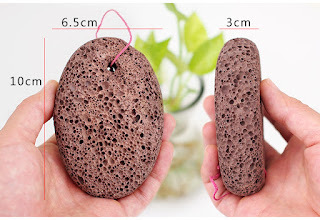 Using volcanic sponge, scrub lightly in circular motion than rinse off lather with warm water. 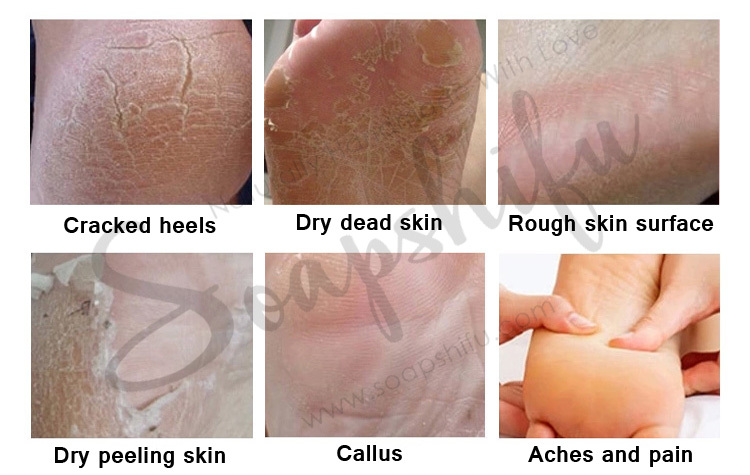 It is known to effectively prevent and remove rough dry skin from both body and feet. *Apply Soapshifu's Chamomile Olive moisturiser for better result to soft tender skin. 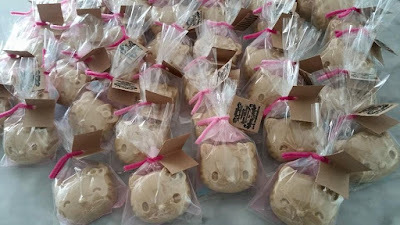 Prepare a pail of water place stone scrub into the pail and soak it over night( depending on size of pail and amount of water used) you will need between 1~ 3pcs. Use the water in the morning/ next day to wash your face or bath. 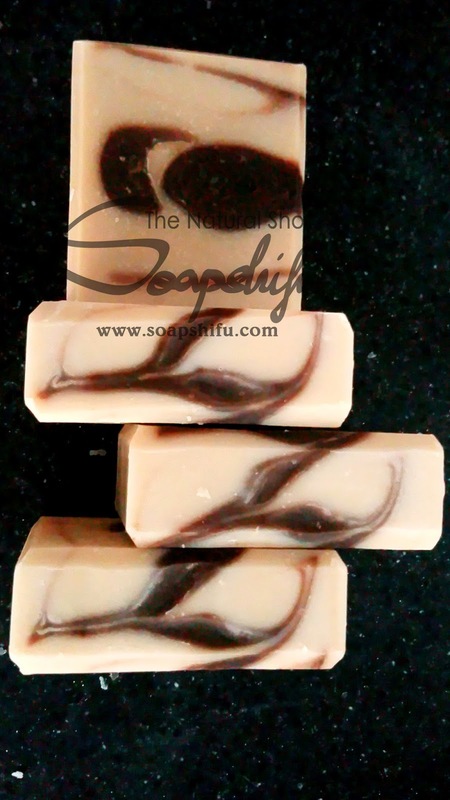 This beauty regime will brighten complexion, moisturises, whitening. 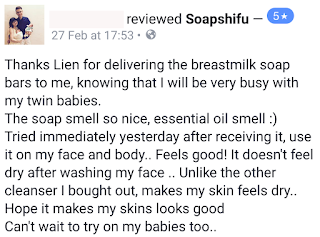 Maintaining a firm and soft supple skin. 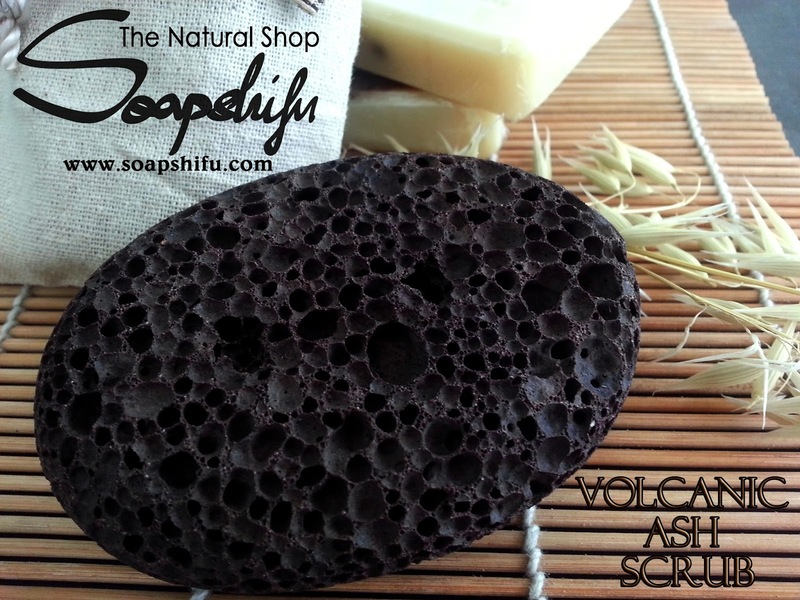 Wash volcanic ash scrub thoroughly with soap after every use. Sun dry stone scrub to naturally sanitise it for future use. **Note : Sharing of Volcanic Ash Stone is not advisable due to hygienic purposes. A visit to the goat farm in Malaysia urge me to make a bar of soap with natural goat milk. There are so many ... I really mean... 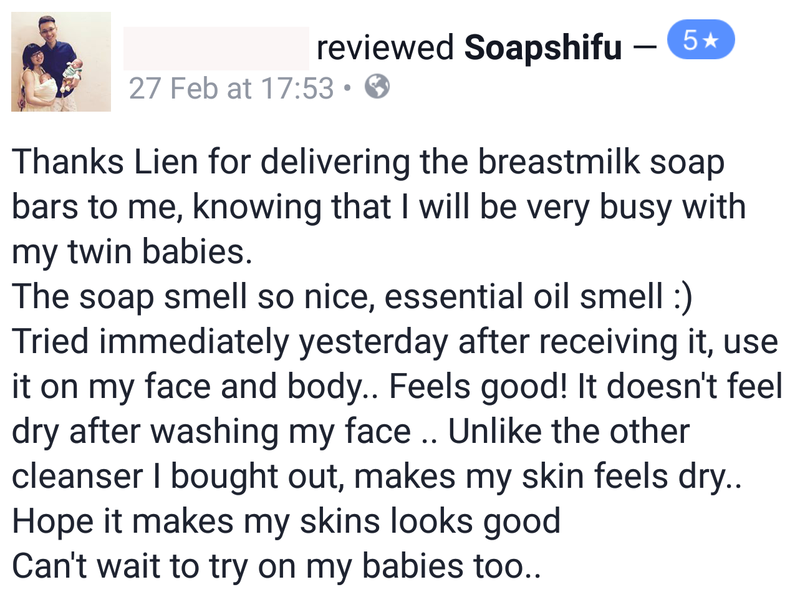 SO MANY... too many to list down and share about what goodies goat milk does for our skin. Below are some benefits you have to know about goat milk. Goat’s milk is rich in essential fatty acids and triglycerides. The essential fatty acids have a unique PH similar to humans, so it is less irritating and more easily absorbed by our skin. 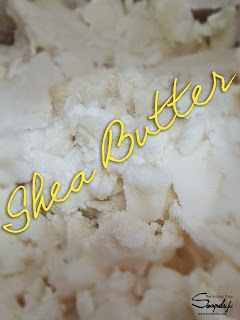 These fatty acids and triglycerides are super moisturizing.. 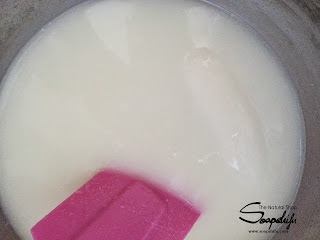 Goat's milk contains lactic acid break down dead skin cells allowing the skin to naturally rejuvenate. Packed with essential vitamins and nutrients... including vitamins A (known for its ability to repair damaged tissue and reduce lines and wrinkles), E, C and B as well as amino and citric acids, unsaturated fatty acids and zinc that feed the skin and are absorbed into the body. It has a PH level very close to that of your skin... which is so mild that even babies and children are suitable to us. 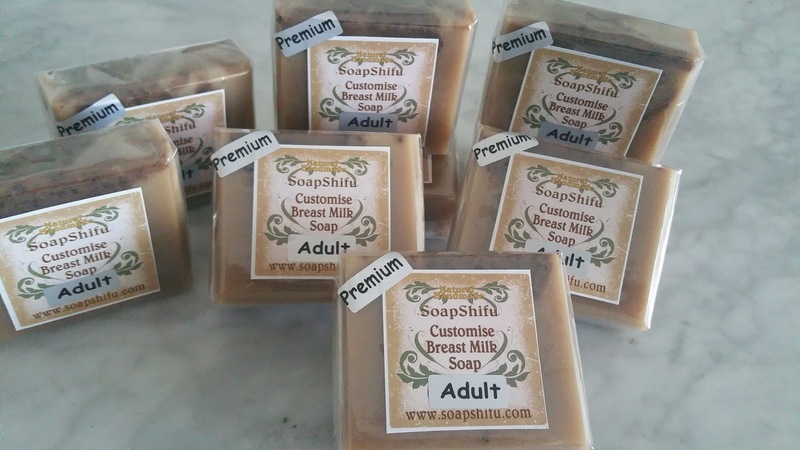 Many believe that goat milk has antiseptic property that aids in protecting your skin from unwelcome bacteria delaying the growth of microbial organisms that aid in reducing acne. 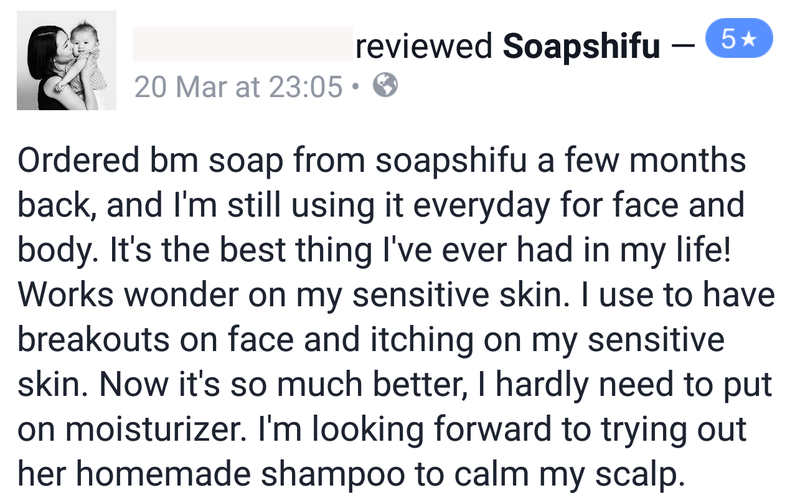 Perfect for most skin types, even the most sensitive skin. 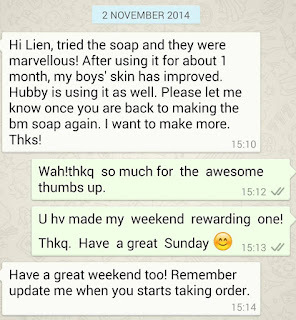 As it contains a natural cleansing agent which will create a mild and gentle soap for extremely sensitive skin. Treating skin conditions like Acne, eczema and rashes. 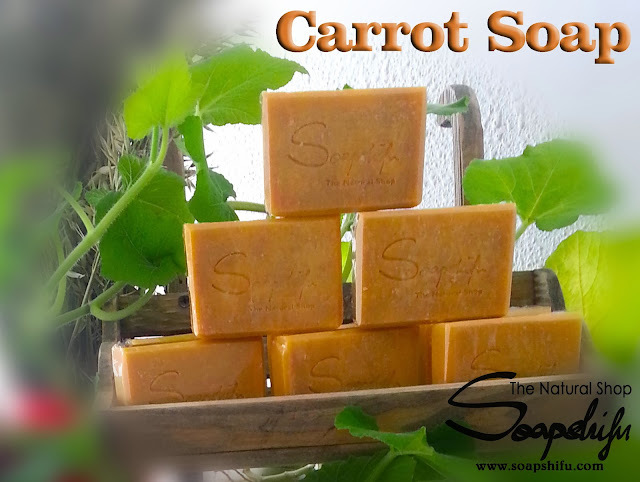 Made with fresh squeezed carrots juice and highly valued carrot seed oil that nourishes the skin care. 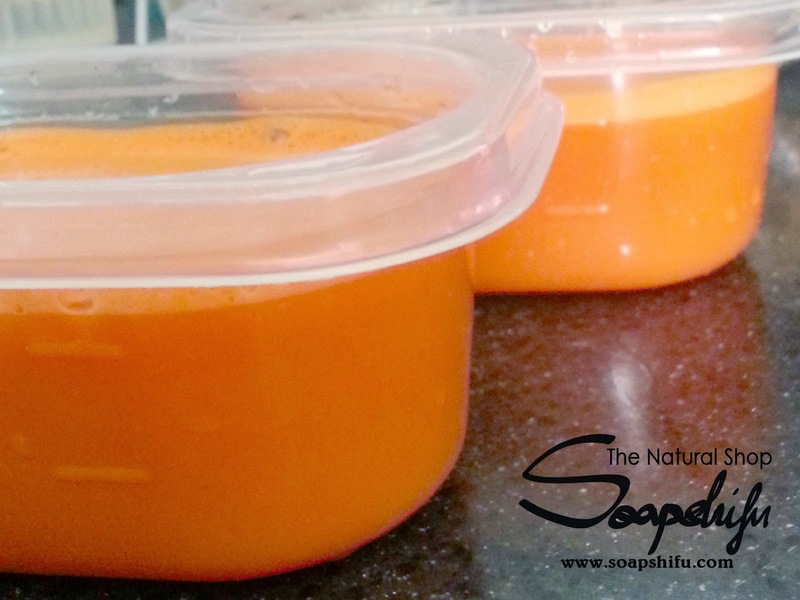 Carrots which contain high natural Vitamin A, E and C with active antioxidant properties aid tightening, moisturing, revitalizing and rejuvenate skin. It visibly improves skin tone, elasticity, and general skin health, claiming to slow the progression of visible wrinkles. A special component found in carrots (Carotenoids) are good for anyone who spends time outdoors as it helps protect skin from environmental assaults like UV rays, pollution, and stress. This range of soap suits all skin types from dry to oily, as it have properties to balance any type of skin. Providing sufficient moisture without clogging pores. 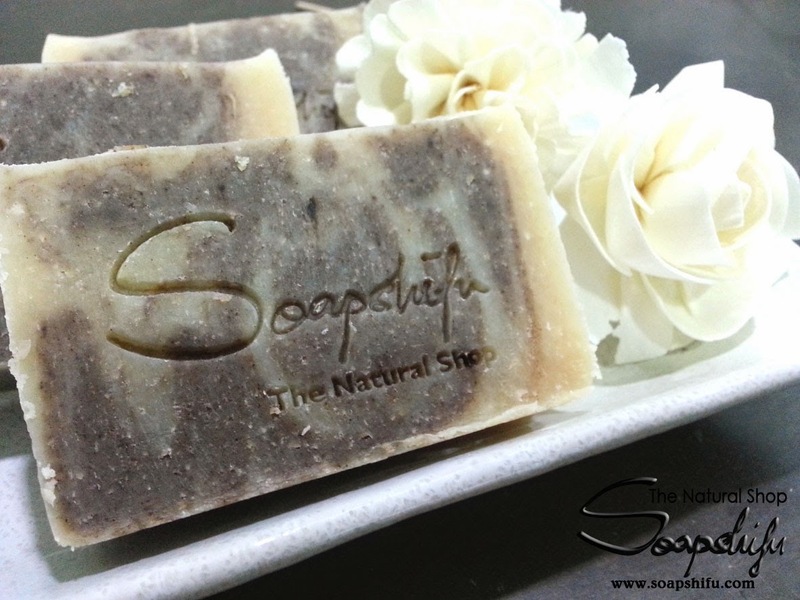 Our chemical free Carrots Soap are also known to be calming and mild which is also suitable for irritated/sensitive skin. 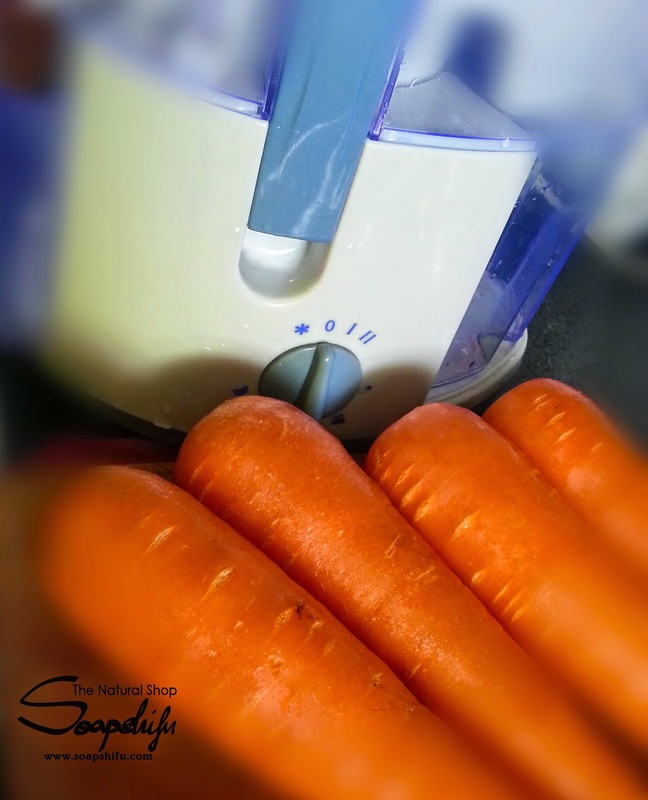 Feed your skin with carrot and feel the difference in no time. 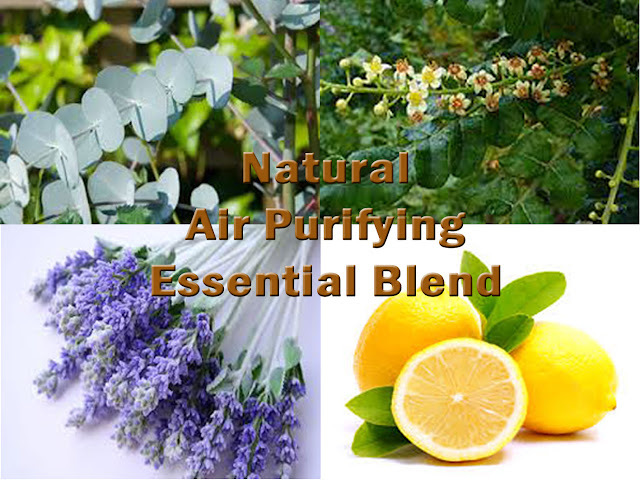 Mist spray blend from 100% natural essential oils is one of the best ways to purify the air you are breathing and keep mossies away from environment. The anti-viral, anti-bacterial, and antiseptic properties of the oils, along with the negative ions and oxygenating molecules that are released by essential oils helps to reduce chemicals, bacteria, and metallics in the air. Dengue is on the rise and lives are compromised. 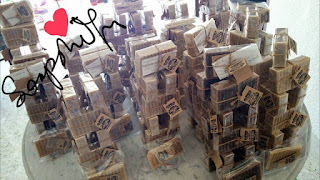 Other than keeping possible breeding area clean and dry, many bought insect repellent to rid dengue. Many people will be spraying insect spray on their skin like no tomorrow not knowing that when they put these sprays and lotions on their skin, they are actually putting pesticides on their body (insect sprays are pesticides known as insecticides). DEET is the active ingredient in most conventional bug sprays and lotions. Few people know that DEET is a registered pesticide and a member of the toluene chemical family. Toluene is an organic solvent that is one of the main ingredients in paint removers, as well as rubber and plastic cements. DEET actually has the ability to melt plastic and synthetic fibers. Your skin is the largest organ of your body, when you spray DEET containing repellents on your skin, it gets absorbed through the skin and passes into the blood. Research has shown that up to 17% of the chemical DEET is absorbed into the bloodstream once applied to the skin. Causing skin irritation and major effects on the central nervous system by causing motor deficits and learning and memory dysfunction. Putting chemicals on our skin in any form, is not good for our health. 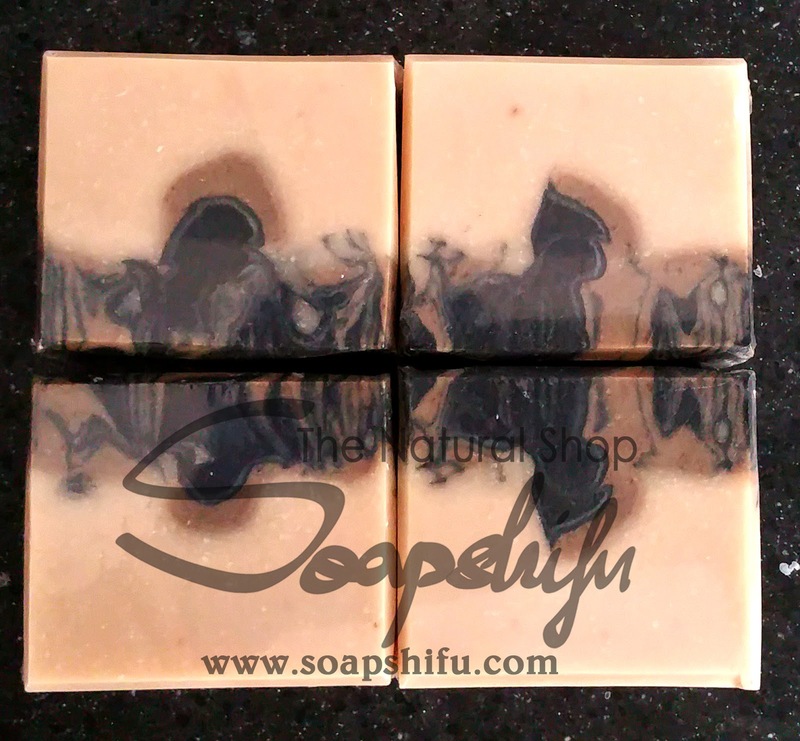 Eucalyptus - Clear mind and focus concentration, reducing swelling in the mucus membranes. 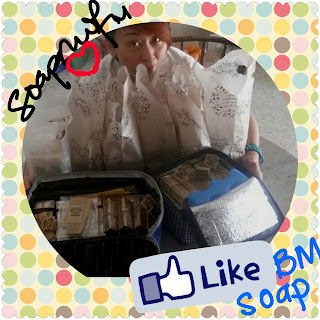 Aid respiratory problems, inflammation, headaches and nervous exhaustion. Lavender - Calming, relaxing oil, which combats stress and crisis, while the antiseptic properties helps with cold, flu and other ailments. It is excellent for asthma and migraines. Lemon Grass - Lemongrass oil revitalizes the body, clears headaches and helps to combat nervous exhaustion and stress-related conditions. Spray mist on your pillowcases, towels, carpets, furniture, rooms and living area. Spray it on your mask before heading outdoor. Spray it in the your car to purify air and rid odour. I am a Certified Soapmaker by HSCG - U.S.A.
We are please to be at our best service to you at all times, but would like to give a gentle reminder that our company policy will be ""No REFUND of purchase, after goods are sold.""